BANGI, 1 November 2014 – The National University of Malaysia (UKM) will continue to maintain its core principles in upholding the bumiputras and their culture while adhering to Islamic values to achieve excellence. 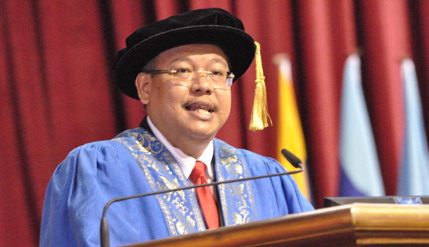 Vice-Chancellor Professor Datuk Dr Noor Azlan Ghazali said the efforts took into account the challenges faced by the university through mobilizing its increasingly diverse resources to achieve its objectives. Addressing the first session of UKM’s 42nd convocation here today, Prof Noor Azlan said such efforts became evident when UKM was ranked at number 259 in the world’s best university this year by QS University Ranking. He said UKM continues to upgrade standards including producing more PhD holders. Thus this year 522 are graduating with the doctorates while 2,243 are receiving their Masters – both the highest number graduating in the history of the university. Recipients of doctors as medical specialists and dentistry increased to 190 while those receiving their bachelor’s degrees increase to 3,433. Altogether 6,266 people graduated at this convocation. The Vice-Chancellor was proud that UKM’s alumni which now totals 170,112, a large network which can contribute to its reputation. In fact, he said, UKM is now the top choice for students from 50 countries. Prof Noor Azlan said that although UKM is based on indigenous culture it nevertheless encourages its students to learn and master the world’s major languages. The university for the first time has invited its alumni to attend the convocation this year. The first session today was to confer the PhD awards and specialists to the Medical and Dentistry Faculties and the faculty of law.